Recently, my lifelong dream of watching Oprah live came to be. It wasn’t exactly a live taping of The Oprah Winfrey Show, I once dreamed of flying all the way to America for. Instead, it was an intimate evening full of life lessons, anecdotes, aphorisms and nuggets of wisdom she wanted to share with her most beloved fans. 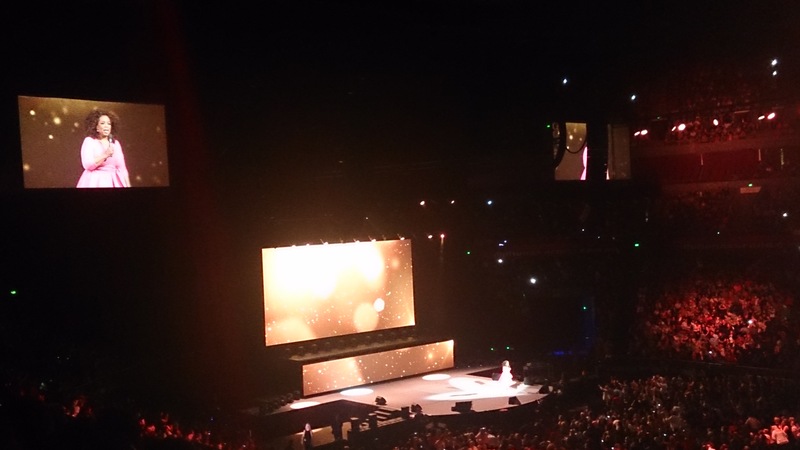 It was very reminiscent of the final episode of The Oprah Winfrey Show customised to a concert arena version she took to five different Australian cities within a two-week period. The arena was full but it wasn’t a sell-out. On her second visit to Australia, there was no Hugh Jackman or Russell Crowe or a plane full of American tourists to back her. It was evident the excitement of Oprah visiting Down Under was not as palpable as it was five years ago. It was just Oprah on stage, raw, sharing a piece of her soul to the loyal following who remained, while many of the ‘fans’ from her 2010 visit had sharply tapered off. This time around, the tickets weren’t free, and semi-good seats barely reached affordable. ‘But she’s already so rich!’ was the first thought that went through my head when it came to buy the tickets. But if rock bands and singers can command that type of pricing, Oprah could very well charge whatever she wanted. Perhaps it was a good way to determine who the real loyalists are and who aren’t. After paying that much for tickets, you can’t blame me for secretly hoping for a new car. As overly sentimental as this may sound, Oprah has become somewhat the big sister, second mother, and mentor since I was a little girl, thanks to my mother, who, when I came home from school, always had The Oprah Winfrey Show blaring on television. Fast track 25 years later, it was no surprise that the 21,000-seat arena was filled with women my age and from my mother’s generation; a minutiae brought (perhaps coaxed) their male counterparts. There are a lot of people who scorn at the thought of anything self-help or motivational. My argument has always been, if you can spend so much time exercising and working on your physical appearance, then why shouldn’t it be applied to your mind? This is what going to this event meant for me. An opportunity to flex another proverbial type of muscle. She told us that we were given another day to live “our best life” and we could “turn up the volume” and literally “step into the life that’s waiting for you”. A lot people are searching for happiness, she said. People look at her and see how happy she is, and Oprah admits at this stage in her life that she is happy – but she’s had to really work at it. The thing with any motivational talk or event such as these, whether you’re watching Anthony Robbins on YouTube, or even going to church for a spiritual uplift, is that they work like a drug. At some point – as soon as you leave the arena – the motivational power starts to wear off, that is, unless you make every conscious effort to apply it every aspect of your life where it’s lacking. Many of the stories, the struggles and the lessons she shared were exactly the same feelings, emotions and lessons I could extract from my own life and I could apply wholeheartedly. The fact that sometimes it’s very hard to articulate any of it, and even harder to talk about it or share it with family and friends, is perhaps proof that people like Oprah exist – they get it – they’re articulating everyone else’s story too. “I’m here to help you see how your life is speaking to you everyday,” she advised.